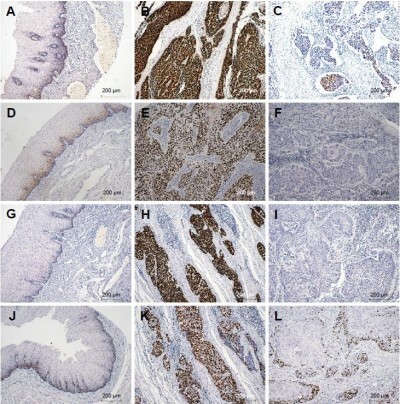 Abstract: In this study, we evaluated SOX2, Cyclin D1, p53, and ki-67 expression immunohistochemically in 117 samples of surgically resected esophageal squamous cell carcinoma (ESCC) and matched normal tumor adjacent tissues and correlated the expression with clinicopathological finding and patient survival. Lymph node metastasis was observed in 36.8% of patients, and organ metastasis was observed in 17.9%. We detected high expression of SOX2, Cyclin D1, p53, and ki-67 in 46.1%, 70.1%, 54.7%, and 32.5% of ESCC tissues, respectively. SOX2 is localized in the tumor cell nuclei, and its expression was significantly associated with N stage (p=0.034) and differentiation (p=0.003) and ki-67 expression (p=0.001), whereas increased Cyclin D1 expression was correlated with high p53 (p=0.015). With regard to survival, we found that ESCC patients with high SOX2 expression had significantly better survival time than those with low SOX2 expression (p=0.021). A multivariate Cox analysis revealed that therapy and high p53 expression and venous invasion were independent predictors of unfavorable prognosis in overall survival (p=0.039, p=0.004, and p=0.023, respectively). Furthermore, higher T stage, clinical stage (pTNM), venous invasion, and high p53 expression were independent predictors of a worse progression-free survival. Notably, co-overexpression of p53 and Cyclin D1 was significantly correlated with poor overall survival and progression-free survival (p=0.029 and p=0.0227, respectively). Therefore, SOX2 might be considered as a potential prognostic indicator and a potential target for therapeutic targets in ESCC. p53 staining and combined p53 and Cyclin D1 expression had significantly unfavorable prognostic value for patients with ESCC. These findings provide more insight into ESCC; thus, further investigations into molecular mechanisms of drug resistance are essential.